Don’t Let Your Health Go Up In Smoke! I’m not sure if it is the crackle of the fire, the warmth it gives off or just good memories of winter fires growing up, but it feels so nice to snuggle up by the fire on a cold day. It is really hard to beat the feelings of warmth and coziness that a fire brings. Plus, for people with a ready source of free wood, it is an economical way to heat up the house. But, despite all the benefits that burning wood might provide, there are some downfalls if you don’t take the right precautions. How can wood fires be harmful? When wood is burned it doesn’t just produce heat. It also produces harmful gases such as carbon monoxide and nitrogen dioxide. And it produces particulates, such as smoke and ash. These pollutants can create poor air quality in your house, which can lead to respiratory problems, such as asthma and bronchitis. What can I do to keep the air cleaner? This doesn’t mean that you should never have a fire again, but it does mean that if you want better air quality you should take a few precautions beforehand. Burn only dry wood: It is important that you don’t burn wet or green wood (you want less than 20% water content). Dry wood improves the combustion and cuts down on pollutants. 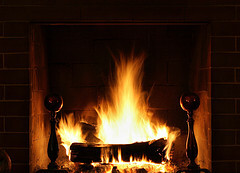 Burn certain types of wood: Maple, oak and elm burn more cleanly then pine, spruce and fir. Make small, hot fires not large, smoky ones: This helps reduce pollution by allowing the wood to burn more thoroughly. Decrease the smoke: Look at the smoke coming out of the chimney. If it is very dark, you are releasing a lot of pollutants. Smoke is a sign of unburned fuel. A cleaner fire, should give off mostly white smoke. Only burn wood: Don’t burn plastics, treated or painted wood, colored paper or garbage. These materials produce even more harmful fumes along with the normal pollutants. So, enjoy your fires, but make sure that you are taking precautions so that you are doing it safer and cleaner. Your health and the health of your family is important enough to take the time to do it right! How Much Exercise to Work Off That Pie? It is nice to have a nice fire but we have to think of the environment. I also remember, some years back, when my children were small, we lighted the fireplace when we were out of electricity for many hours. It was nice, warm and cozy!! !